We are happy to announce our brand new publication: Porphyreon. 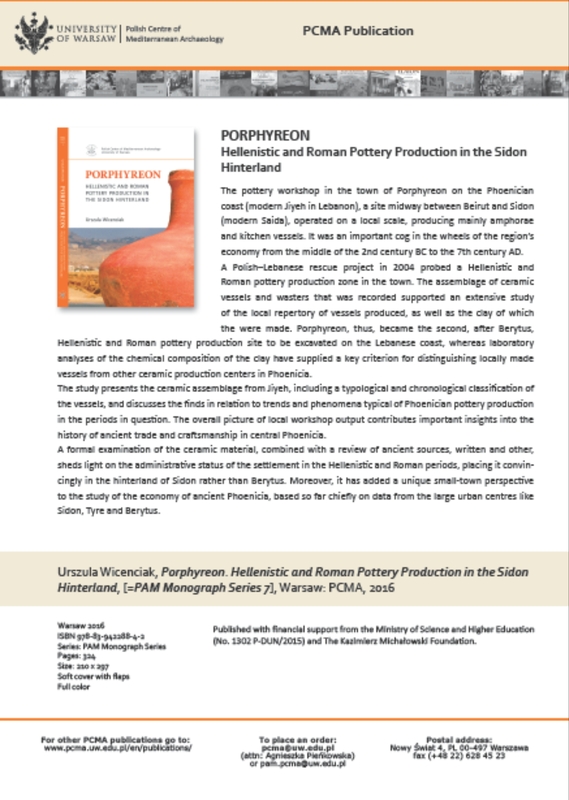 Hellenistic and Roman Pottery Production in the Sidon Hinterland. This book, by Dr. Urszula Wicenciak, is the 7th volume in our PAM Monograph Series. The pottery workshop in the town of Porphyreon on the Phoenician coast (modern Jiyeh in Lebanon), was probed during a rescue project in 2004 by a PCMA UW mission working at the sites of Jiyeh and Chhîm. The workshop operated on a local scale, producing mainly amphorae and kitchen vessels. It was an important cog in the wheels of the region’s economy from the middle of the 2nd century BC to the 7th century AD. The assemblage of ceramic vessels and wasters supported an extensive study of the local repertory of vessels produced there and of the clay of which they were made. Porphyreon, thus became the second, after Berytus, Hellenistic and Roman pottery production site to be excavated on the Lebanese coast. The study presents the ceramic assemblage from Jiyeh, including a typological and chronological classification of the vessels, and discusses the finds in relation to trends and phenomena typical of Phoenician pottery production in the periods in question. The overall picture of local workshop output contributes important insights into the history of ancient trade and craftsmanship in central Phoenicia. Dr. Urszula Wicenciak is a researcher at the PCMA UW specializing in Near Eastern ceramics from the Hellenistic through Byzantine periods. In recent research she focu ses on a typological, cultural, and regional analysis of the pottery production in Phoenicia. Her current interests derive from her involvement in the Porphyreon excavation project of the PCMA UW in Jiyeh (Lebanon). She has also participated as ceramologist and archaeologist in other excavation projects in Lebanon, Egypt, Sudan, Kuwait, and Sicily. The book was published with financial support from the Ministry of Science and Higher Education (No. 1302 P-DUN/2015) and The Kazimierz Michałowski Foundation.